The observations of wood at the seabed at Lavani were infrequent and it was not encountered at all at Zafarani. Tube worms covered the surface of the wood which also supported a number of anemones. 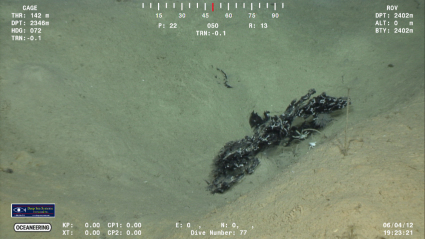 In addition to the sessile fauna utilizing the wood as a substratum, there were numerous tubes worms (ampharetidae or sabellidae) and squat lobsters (Galatheidae) on the sediment around the wood. 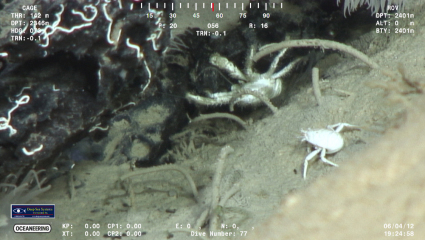 The squat lobsters are likely of the genus Munidopsis which have been reported to feed on wood that has been degraded by bacteria (Hoyoux et al. 2012). They possess specialist spoon-shaped claws which they use to tear off pieces of decaying wood. Gut bacteria also aid in the squat lobsters’ digestion of the wood. 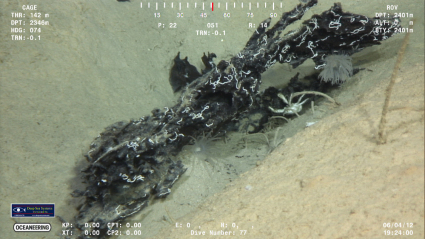 As the bacteria, wood-boring organisms and squat lobsters gradually breakdown the wood its energy is slowly distributed to the surrounding sediments. The enrichment of the sediment in the immediate vicinity of wood in the deep sea can dramatically increase the abundance of macrofaunal organisms over an extended time period (Bernardino et al. 2010).